After Juliet director Sarah Delahunty talks to drama on the waterfront about the current Circa Two hit. Recently I was idly watching “Shakespeare in Love” on TV (while working on a rehearsal schedule for something and eating dinner) - but when I saw the supposed first stage performance of Romeo and Juliet and heard those words as if performed for the first time, I was seriously struck by how many centuries this play had survived, as alive now to so many people as it was then. And that here I was also working with this story as if it was happening to young people here and now. After Juliet takes us into the fallout from those deaths, where the violence that caused them to happen still reverberates. Despite pronouncements from authorities on ending violence, this community is too deeply divided to easily change – or is it humanity as a whole? Is it just this group of teenagers struggling without help through their shock and anger or a bigger lack of acceptance, love and emotional maturity in the world around them? What choices are they really able to see at this time? Ist Gear Productions is a group that puts on plays with young actors to give them the opportunity to work to a high standard of production on plays that are relevant to them, often written for specific groups of actors by myself. I have always found this age group an exciting and rewarding one to work with. In After Juliet we have an age range of 17 – 23 years - one still at school, one on stage for the first time, a few having now got several productions under their belts. And all with great focus and commitment to making this play work. 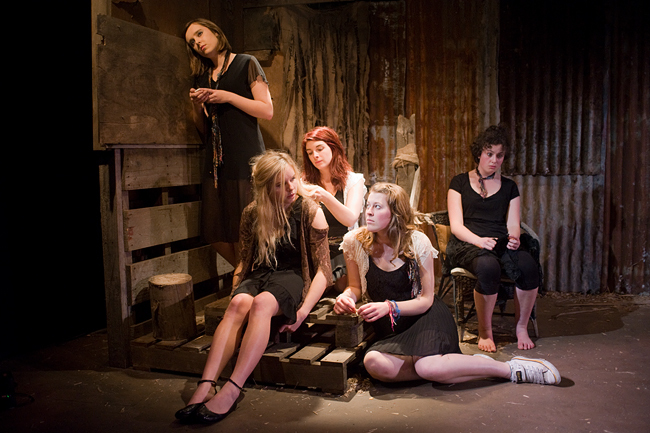 After Juliet runs in Circa Two until 8 June - to book, call the box office on 801-7992 or visit www.circa.co.nz.